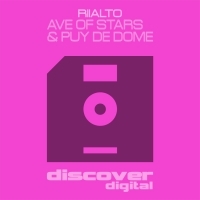 German-based DJ and Producer Riialto debuts on Discover Digital with an exciting double-single 'Ave of Stars' / 'Pui De Dome'. 'Ave of Stars' is a starscape of a track, with sweeping chords and a mystical late-night breakdown. 'Puy De Dome' is a stark contrast, with bigger beats, acid-infused bass and peak-time chords. 'Ave of Stars / Puy De Dome' is available now from Beatport and iTunes.